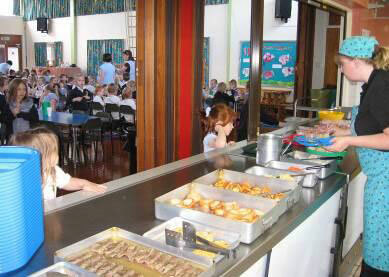 The school employs a Senior Supervisor for the lunch period along with a team of lunchtime Supervisory Assistants. Lunches are cooked on site by the catering company HC3S. Alternatively children can bring in healthy packed lunches or go home to lunch. From September 2014, the Government provided a universal ‘free’ school lunch for all Infant children. However, if you are in receipt of certain state benefits (that would previously have entitled your child to free school lunches under the old system), please complete the documentation contained in our application forms. This will ensure the correct funding is paid to the school. If your child has food allergies you must complete a form, provide medical evidence, and have this authorised by HC3S before any meals are taken. HC3S Catering Service – Click here for Hampshire County Council Catering Services.